Click on this detail of an important Incan bag to compare with other published examples of the type. 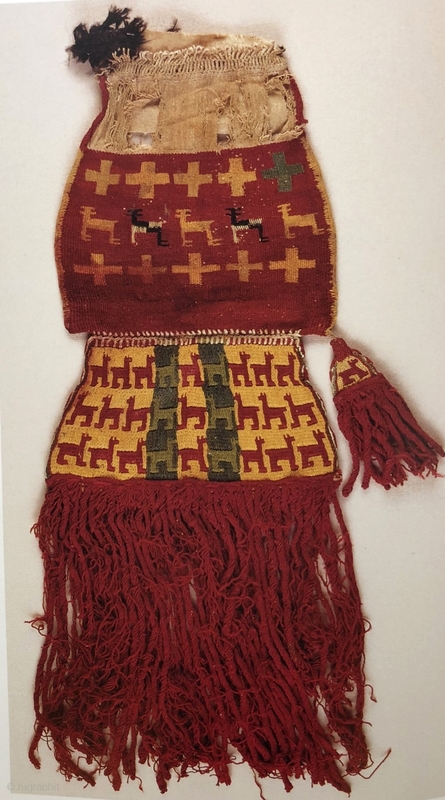 Dating to a.d. 1400 - 1540 these rare, complex, Andean weavings are thought to have been used by Incan elites and officials for important ceremonial occasions. Made to hold leaves of the sacred coca plant, the exceptionally large size of these bags and their imagery signaled the prestige of the owner within Incan society. 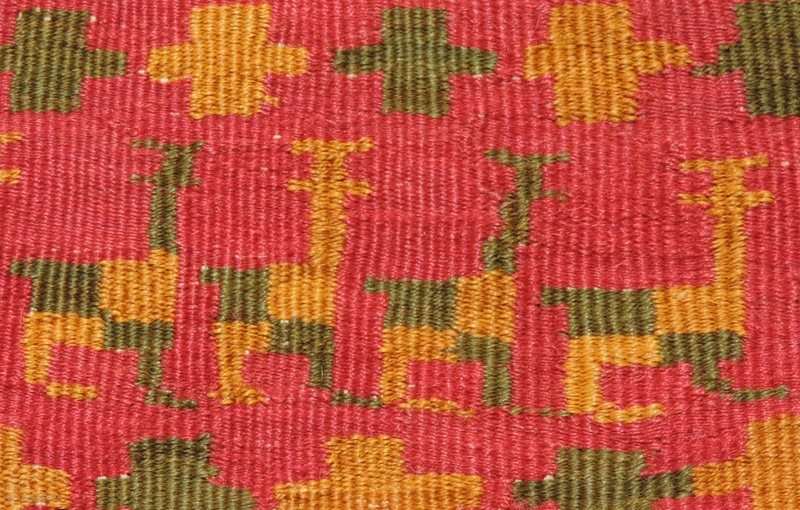 The design shows camelid herds and/or llama caravans, symbols of wealth and fertility in the Andean world. These remarkably complex bags were constructed using six or seven different textile structures. 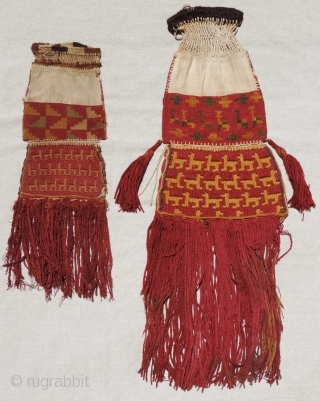 All bags pictured here have a characteristic feature not seen in other coca bag types. The lower section of each has a dense, colorful fan-shaped pendant that is purely decorative. It is not meant to hold anything. These pendants with rows of camelids are constructed of sturdy alpaca yarns worked in a complimentary braid-like structure. Colors reverse from one face of the pendant to the other. Since they serve no functional purpose these pendants are clearly meant to exaggerate the size of these bags and to further enhance the prestige of the owner. 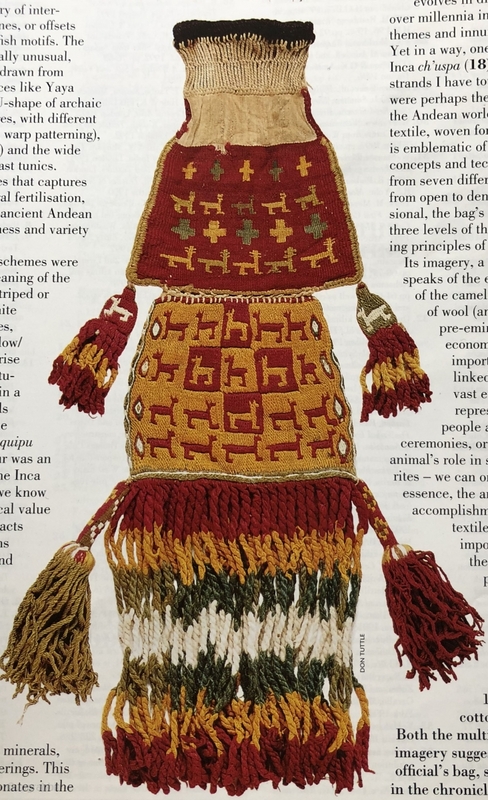 The largest Textile Arts bag measures an impressive 29 x 10 inches which is larger than a highly regarded bag of the type published in an article discussing the coca cults and rituals of the Andes in Hali 100, page 115. 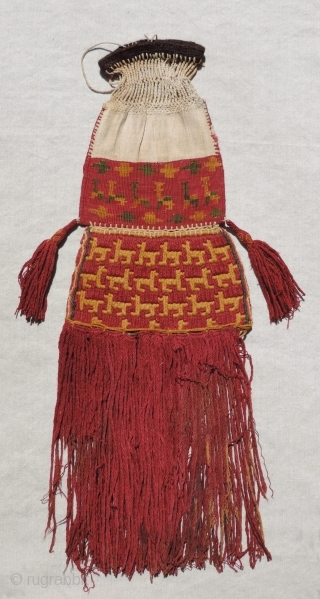 The Hali 100 bag measures 25 x 8 inches and is thought to be the most outstanding example of the type in both design and condition. Having sold that bag some years ago, i know it well. It is now in the collection of the Metropolitan Museum of Art. Also pictured here for comparison are other examples from both the Metropolitan Museum of Art and the Museum of Fine Arts Boston. One striking difference seen in the Met and the Hali bags is the way the long fringes were constructed to imitate tie-dye. The bag's multi-colored fringes were looped together to create this effect. Also included in this grouping of bags is an image of a smaller sized, less ornate bag of the type for comparison. Both this and the larger Textile arts bags are currently for sale. 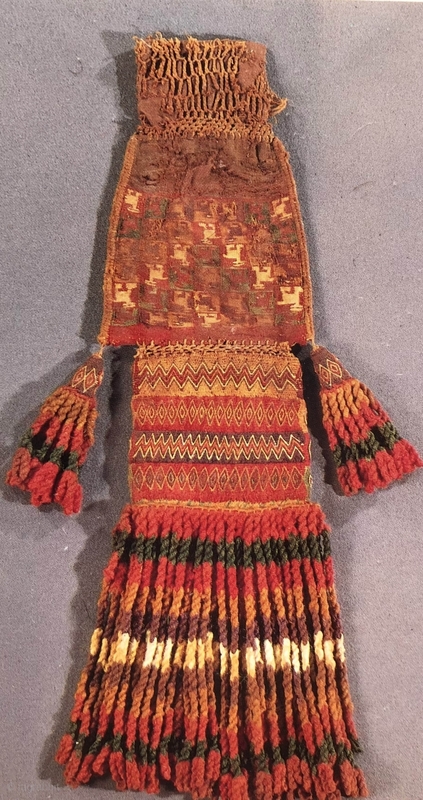 The largest Textile Arts bag is the best example of the type I've seen for sale in the last 30 plus years - with the exception of the Hali 100 - now Met bag. 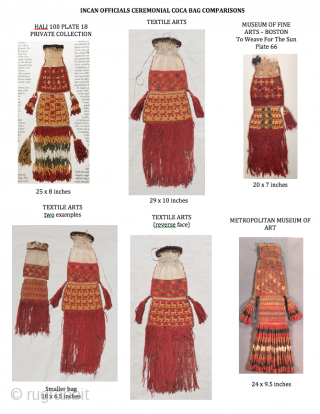 These bags are not only rare, but important collectors pieces - well worth collecting and priced to sell.